A dead climate satellite that has been gradually falling toward Earth is expected to plummet down within days, making it the most massive NASA satellite to make an uncontrolled re-entry into Earth's atmosphere in over three decades, agency officals say. NASA's Upper Atmosphere Research Satellite, or UARS, is expected to plunge toward Earth sometime around Friday (Sept. 23), based on the latest estimates by the agency's orbital debris experts. The bus-size UARS satellite is one of the largest NASA satellites to plunge back to Earth uncontrolled in more than 30 years. Skylab was the first American space station and fell to Earth in 1979, with debris falling into the Indian Ocean and onto parts of Australia. In 2003, debris from NASA's 100-ton space shuttle Columbia fell over Texas during re-entry in a tragic accident that killed seven astronauts. However, Columbia was a crewed spacecraft —not an unmanned satellite — and broke apart due to heat shield damage during what was supposed to be a controlled descent and landing. Yet, despite the uncontrolled nature of the UARS spacecraft's return, the chance of any debris landing in a populated area remains extremely remote, agency officials said. According to NASA, there is a 1-in-3,200 chance that debris from the UARS satellite could hit anyone anywhere in the world. But, calculating the chance that you will get hit is a different figure entirely, and the odds of that happening are somewhere on the order of 1-in-several trillion, Matney said. "There's always a concern," Mark Matney, a scientist with NASA's Orbital Debris Program Office, said in an interview. "But, populated areas are a small fraction of the Earth's surface. Much of the Earth's surface has either no people or very few people. We believe that the risk is very modest." Current predictions of the debris drop zone cover most of the planet — anywhere between the latitudes of northern Canada and southern South America. Scientists will not be able to narrow down the impact zone until about two hours before pieces of the defunct satellite hit the ground. "It is still too early to predict the time and location of re-entry," NASA officials said in their latest update. "Predictions will become more refined over the next two days." Scientists in the agency's Orbital Debris Program Office estimate that at least 26 large pieces of the satellite will survive the fiery trip through Earth's atmosphere. UARS is expected to re-enter over a 500-mile (804-kilometer) path, but since majority of the Earth is covered with ocean, debris from the satellite will likely fall over water or remote, desolate regions of the planet, NASA officials have said. "We're pretty small compared to the total land surface area of the Earth," Williamson told SPACE.com. "There is so much open space and ocean that generally we don't have to worry very much about debris hitting a structure or a human." The massive climate satellite measures 35 feet (10.7 meters) long and 15 feet (4.5 m) wide. Originally, agency officials thought the UARS satellite would fall to Earth sometime between late September and early October, but due to heightened solar activity last week, the spacecraft has been falling faster than expected. "As sunspots increase on the sun, the type of extreme ultraviolet radiation that affects the upper atmosphere increases also," Matney explained. "The more the atmosphere heats, the more it expands, and the spacecraft sees more drag." 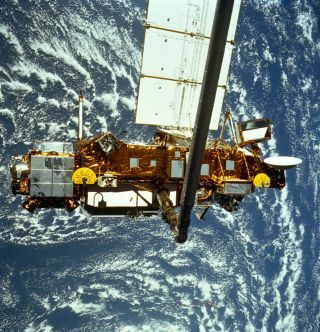 The $750 million UARS satellite was launched in 1991 aboard the space shuttle Discovery to study the ozone layer and Earth's upper atmosphere. The spacecraft far outlived its original three-year mission, but was finally decommissioned by NASA in December 2005. Even though the falling UARS satellite is not expected to pose a significant danger to humans, Williamson hopes the event highlights the critical nature of space debris, and the need to promote space situational awareness. "It's a serious issue," he said. "I directed this project that did the first space debris study for US Congress. At that point, hardly anybody knew about space debris, and I thought it was very frustrating because I could see the way things were going. It turns out a decade or two later, the issue has become so concerning to people that they have begun to pay real attention to it. I think this re-entry will certainly cause a lot of interest in people."